Today is the birthday of Sam Hardy (1883-1935). Like many a Broadway show, he was born in New Haven. At the age of 21, he was cast in his first Broadway show, the melodrama The Fortunes of the King. Over the next 15 years, he was to star in ten shows, mostly comedies and musicals, the most significant being the Ziegfeld Follies of 1916, where he performed with, and became fast friends with W.C. Fields, Eddie Cantor, Will Rogers and Bert Williams. The relationship with Fields was especially close, which would bear fruit several years later. 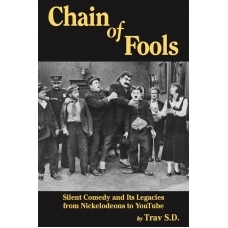 Hardy broke into films in 1915 in the Universal comedy Just Forgot with Marie Cahill. 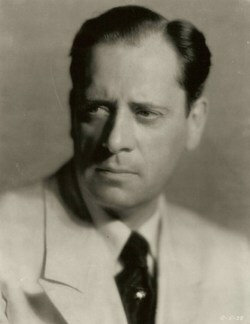 Plum roles during the silent period included Simon Legree in the 1918 version of Uncle Tom’s Cabin, the title character in the 1921 adaptation of George M. Cohan’s Get Rich Quick Wallingford, and 2nd billing in the 1928 adaptation of George S. Kaufman’s The Butter and Egg Man. His tall stature, striking looks and intense eyes served him well in silents; his deep, booming voice proved to be an asset in talkies. Memorable films from this period include the all star backstage musical On with the Show! (1929), The FloraDora Girl with Marion Davies (1930), and King Kong (1933). In 1935, he worked on The Man on the Flying Trapeze with W.C. Fields, co-writing the story and (uncredited) co-directing the picture with him. Later that year, while acting in Eddie Cantor’s Strike Me Pink (originally titled Shoot the Chutes), he developed an intestinal ailment that killed him on the operating table. The blow was especially great to Fields, who was just beginning to develop a highly productive working relationship with him. Hardy wasn’t just a good gag man, but because of his long time in the theatre he was also a good story and structure man. They undoubtedly would have gone on to do more great things together. Further, Fields lost many good friends at around this time, including Will Rogers, who died in a plane crash. In terrible health himself, many people thought The Man on the Flying Trapeze would be Fields’ last movie. This is idle speculation but I wonder….did the years of drinking the same prohibition era booze that damaged Fields’ health, kill Sam Hardy? The men were drinking buddies. There’s a certain logic to it, if nothing else. For more on show biz history, consult No Applause, Just Throw Money: The Book That Made Vaudeville Famous, available at Amazon, Barnes and Noble, and wherever nutty books are sold.